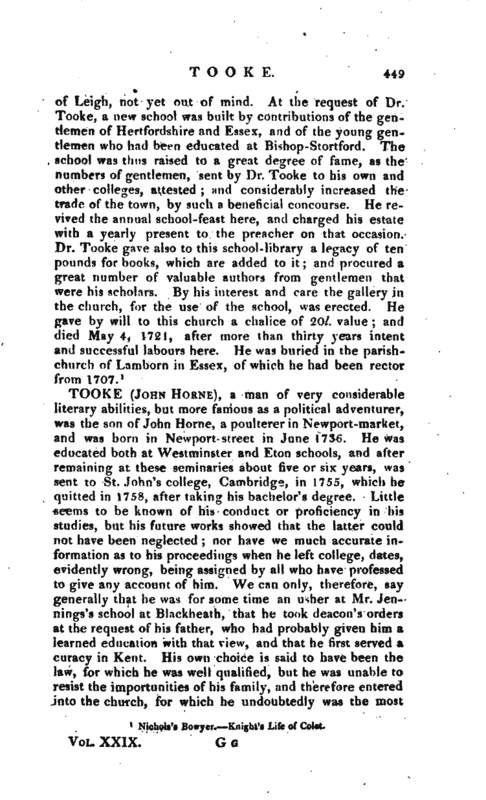 , a man of very considerable literary abilities, but more famous as a political adventurer, was the son of John Home, a poulterer in Newport-market, and was born in Newport street in June 1736. He was educated both at Westminster and Eton schools, and after remaining at these seminaries about five or six years, was sent to St. John’s college, Cambridge, in 1755, which he quitted in 1758, after taking his bachelor’s degree. Little seems to be known of his conduct or proficiency in his studies, but his future works showed that the latter could not have been neglected; nor have we much accurate information as to his proceedings when he left college, dates, evidently wrong, being assigned by all who have professed to give any account of him. We can only, therefore, say generally that he was for some time an usher at Mr. Jennings’s school at Blackheath, that he took deacon’s orders at the request of his father, who had probably given him a learned education with that view, and that he first served a curacy in Kent. His own choice is said to have been the law, for which he was well qualified, but he was unable to resist the importunities of his family, and therefore entered into the church, for which he undoubtedly was the most | unfit man that ever disgraced the profession. This was a radical error in his outset, and eventually the cause of much of the obloquy which attended his life. It is, as a very acute writer has observed, very necessary to keep steadily in view, in order to form a correct and candid estimate of his character, “that he was from beginning to end, a man labouring under great, perpetual, irremoveable civil disabilities.” It was a real misfortune to a man of an enterprizing disposition, and one regardless, as Home Tooke was, of the means by which such a disposition may be indulged, to become a member of an order, in which propriety and duty enjoin a sparing and partial interference with the concerns of the world, and in which, if propriety and duty are found too feeble restraints, the law interposes with a strong arm, to curb profane activity and unprofessional exertions. The die, however, was cast. In 1760, Mr. Tooke received priest’s orders, and was inducted to the chapelry of New Brentford, which his father had purchased for him. In what manner he performed the duties of this office, we have no certain information. What he thought of his profession is less doubtful. In one of his letters to Wilkes, whom he hoped to gratify by such a declaration, he says, “It is true I have suffered the infectious hand of a bishop to be waved over me whose imposition, like the sop given to Judas, is only a signal for the devil to enter but I hope I have escaped the contagion and, if I have not, if you should at any time discover the black spot under the tongue, pray kindly assist me to conquer the prejudices of education and profession.” This letter was written while he was travelling in France as tutor to the son of Mr. Elwes of Berkshire; and on this expedition he threw off every external appearance of the clerical character, which, however, he resumed on his return, and for some time continued to officiate at Brentford. In 1771, he went to Cambridge for the purpose of taking the degree of M. A. which was granted to him, although opposed by some of the members, and particularly by the afterwards celebrated Dr. Paley. He now returned, and mixed, as much as he could, in the temporary politicks of the day. It would be as tedious as useless to revive the memory of all his newspaper effusions. The most finished | specimen of his composition is probably to be found in two or three letters written in answer to the attacks of Junins: and he had the honour, which in those days was deemed no inconsiderable one, of being the only knight that returned with his lance unbroken from a combat with that unknown but terrible champion. If he wants the exquisite polish and the brilliant invective of his adversary, that dexterous malignity which comes in with such effect to blacken a character by insinuation, after invective has exhausted its powers; and above all, that well-sustained tone of austere dignity which gives to Junins the air and authority of a great personage in disguise; he is superior to him in facility, vivacity, and that appearance of plainness and sincerity which is of such importance in controversial writings. Soon after these controversies he resigned his living at Brentford, and, as far as he could, the clerical character. That he could not do so altogether, evidently soured his temper for the rest of his life, and prompted him to those sallies of profaneness, and that general conduct, which showed his contempt for the profession and every thing that belonged to it. He now studied the law, with an intent to practise; and while thus employed, an incident occurred which was important to his future fortune. This was his rendering a service to a Mr. Tooke of Purley in Surrey, in the case of an inclosure-bill, who, in gratitude, made him his heir; but he did not reap the full benefit of this intention, and it is said that first and last all he received from Mr. Tooke amounted to no more than 8000l. * It was on this account, however, that some time afterwards, he assumed the name of Tooke. The particulars of this cause are related with so little attention to facts by most of his biographers, that we have not thought it necessary to attempt reconciling the different accounts of a matter now of comparative insignificance. Mr. Tnoke died in 1803, and left our author a legacy of only 500l. and to his natural daughters 100l. 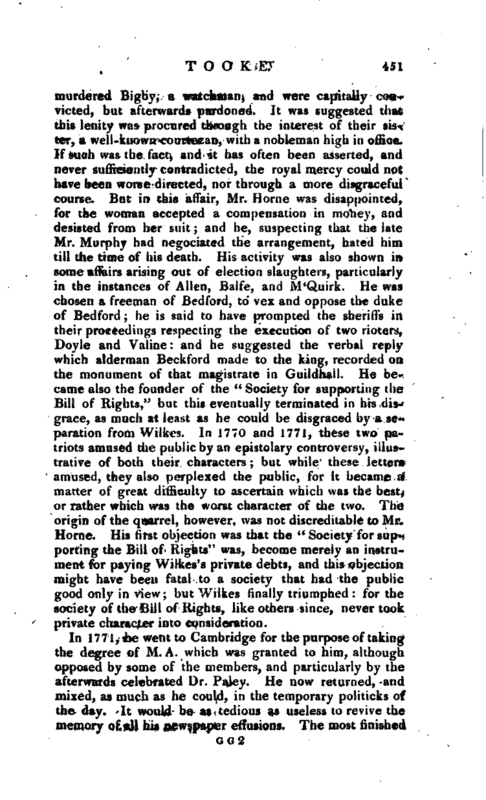 each, H had endeavoured to guard against the caprice of this beneftctor by an agreement with his nephew, and supposed only competitor, colonel Mar, wood, that, whoever might be the fortunate man, the prize should be equally divided: but the bulk of the property being bequeathed to a Mr. Beazeley, the colonel would only give a bond for 4000l. which led to a tedious and expensive chancery suit. In 1780, he published an invective against the war, called “Facts,” in which Dr. Price supplied two chapters on finance; but the war was soon over, and Mr. Tooke became a farmer in Huntingdonshire; but making no figure in this employment, he returned to London at a time | when the contests between the administrations of Mr. Pitt and Mr. Fox promised a wide field for his exertions. 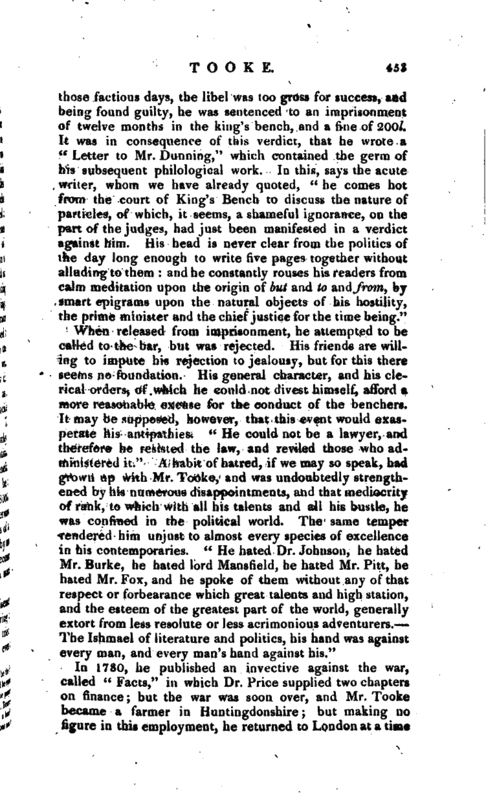 This produced “A Letter on Parliamentary Reform,” in which he is the advocate for universal suffrage; and he sided with Mr. Pitt against Mr. Fox, whom he considered as disgraced by the coalition. It may be here mentioned, although out of chronological order, that in 1788 he published “Two Pair of Portraits;” the figures in which were the two Pitts and the two Foxes, of the past and present generation, the preference being given to the Pitts; but praise was not much in Mr. Tooke' s way; and in a few years both Pitt and Fox shared his aversion alike. In 1786 he published an octavo volume, entitled “Epea Pteroenta, or the Diversions of Purley,” which has given him a considerable rank in the literary world, although opinions were long at variance on the merit of his system, which he afterwards expanded in two volumes, quarto. It seems now generally agreed that this work evinces ingenuity and research; and has served to illustrate some passages hitherto little understood in our ancient poets. 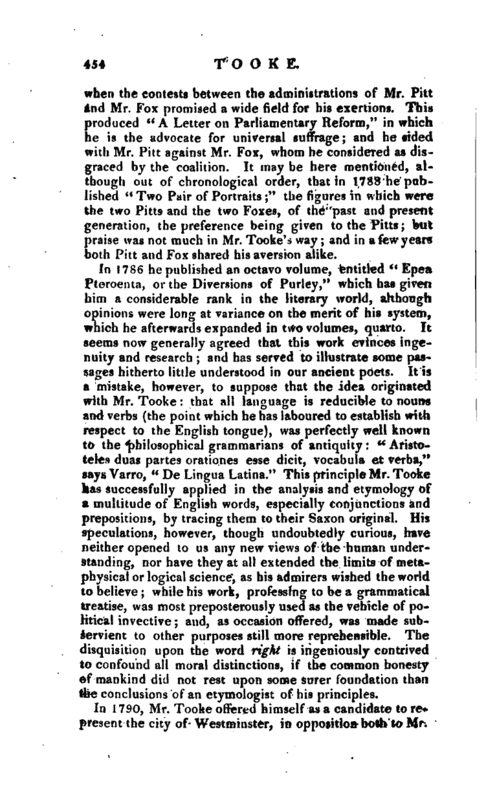 It is a mistake, however, to suppose that the idea originated with Mr. Tooke: that all language is reducible to nouns and verbs (the point which he has laboured to establish with respect to the English tongue), was perfectly well known to the philosophical grammarians of antiquity: “Aristoteles duas parte.s orationes esse dicit, vocabula et verba,” says Varro, “De Lingua Latina.” This principle Mr. Tooke has successfully applied in the analysis and etymology of a multitude of English words, especially conjunctions and prepositions, by tracing them to their Saxon original. His speculations, however, though undoubtedly curious, have neither opened to us any new views of the human understanding, nor have they at all extended the limits of metaphysical or logical science, as his admirers wished the world to believe; while his work, professing to be a grammatical treatise, was most preposterously used as the vehicle, of political invective; and, as occasion offered, was made subservient to other purposes still more reprehensible. The disquisition upon the word right is ingeniously contrived to confound all moral distinctions, if the common honesty of mankind did not rest upon some surer foundation than the conclusions of an etymologist of his principles. In 17yO, Mr. Tooke offered himself as a candidate to represent the city of Westminster, in opposition both to Mr. | Fox and lord Hood, and on the hustings from day to day displayed that kind of oratory which was likely to gain the affections of a mob. He did not, however, succeed, although he polled near 1700; but it afforded him an opportunity of sending a petition to the House of Commons, filled with coarse invective, which was declared frivolous and vexatious. His next memorable appearance was at the bar of the Old Bailey, where he was tried in 1794 for high treason. The history of the trial is too recent to require a particular detail. It is well known he was acquitted, and that the event to him was no small triumph. There was no sufficient proof of the charge; and as he knew himself to be perfectly safe, he displayed, on his trial, a degree of coolness, presence of mind, wit and subtlety, which astonished and delighted a great portion of his hearers. Even his adversaries have allowed that he was endowed with every species of courage, active and passive,personal and political, although some of them have expressed his courage by the more offensive word, impudence. 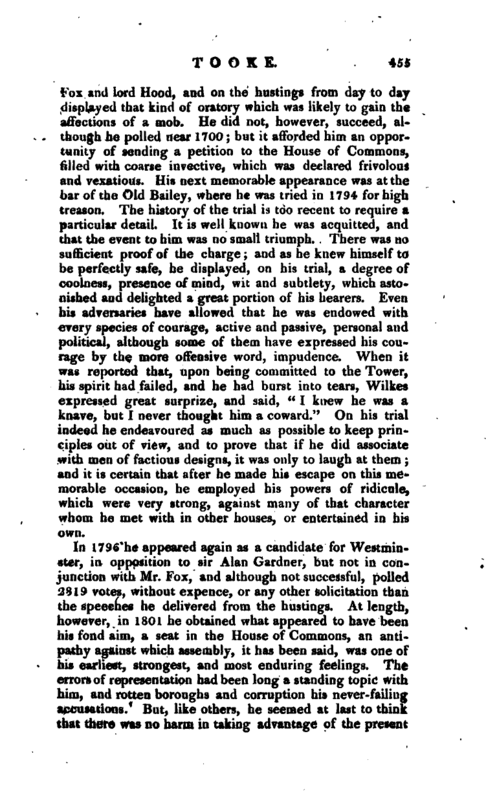 When it was reported that, upon being committed to the Tower, his spirit had failed, and he had burst into tears, Wilkes expressed great surprize, and said, “I knew he was a knave, but I never thought him a coward.” On his trial indeed he endeavoured as much as possible to keep principles out of view, and to prove that if he did associate with men of factious designs, it was only to laugh at them; and it is certain that after he made his escape on this memorable occasion, he employed his powers of ridicule, which were very strong, against many of that character whom he met with in other houses, or entertained in his own. In 1796 he appeared again as a candidate for Westminster, in opposition to sir Alan Gardner, but not in conjunction with Mr. Fox, and although not successful, polled 2819 votes, without expence, or any other solicitation than the speeches he delivered from the hustings. At length, however, in 1801 he obtained what appeared to have been his fond aim, a seat in the House of Commons, an antipathy against which assembly, it has been said, was one of his earliest, strongest, and most enduring feelings. The errors of representation had been long a standing topic with him, and rotten boroughs and corruption his never-failing accusations. But, like others, he seemed at last to think that there was no harm in taking advantage of the present | system as long as it lasted. The borough of Old Sarum, offered to him by a young and almost insane nobleman, and which had been a bye-word among parliamentary reformers, had the singular honour of returning him to parliament, and he took his seat, apparently, without any scruple as to the number or quality of his constituents; nor did his dislike to the present order of things reach its utmost height, till all the doors of the House had been finally barred against him by an act of the legislature. In the mean time the expectations excited by his election were completely disappointed. He made no figure in parliament that answered either the hopes or wishes of his friends; and he bad not sat long before his incapacity, as being a priest, was called in question, and it was proposed to expel him. 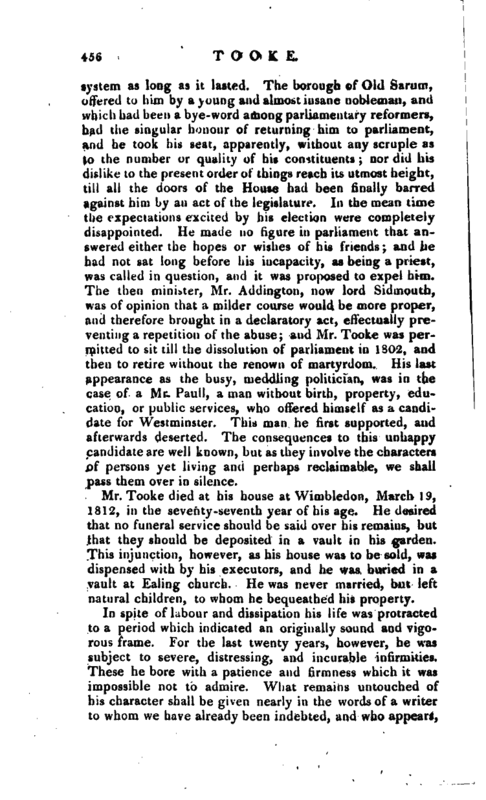 The then minister, Mr. Addington, now lord Sidmouth, was of opinion that a milder course would be more proper, and therefore brought in a declaratory act, effectually preventing a repetition of the abuse; and Mr. Tooke was permitted to sit till the dissolution of parliament in 1802, and then to retire without the renown of martyrdom. His last appearance as the busy, meddling politician, was in the case of a Mr. Paull, a man without birth, property, education, or public services, who offered himself as a candidate for Westminster. This man he first supported, and afterwards deserted. The consequences to this unhappy candidate are well known, but as they involve the characters of persons yet living and perhaps reclaimable, we shall pass them over in silence. 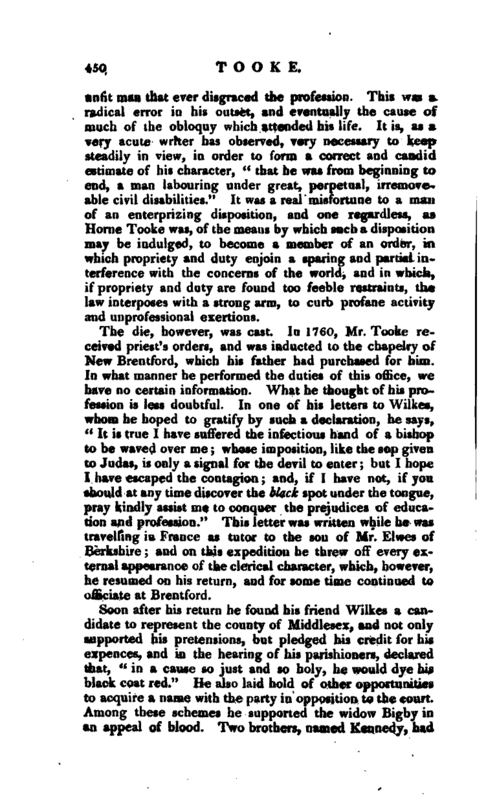 Mr. Tooke died at his house at Wimbledon, March 19, 1812, in the seventy-seventh year of his age. He desired that no funeral service should be said over his remains, but that they should be deposited in a vault in his garden. This injunction, however, as his house was to be sold, was dispensed with by his executors, and he was buried in a vault at Baling church. He was never married, but left natural children, to whom he bequeathed his property. In spite of labour and dissipation his life was protracted to a period which indicated an originally sound and vigorous frame. For the last twenty years, however, he was subject to severe, distressing, and incurable infirmities. These he bore with a patience and firmness which it was impossible not to admire. What remains untouched of his character shall be given nearly in the words of a writer to whom we have already been indebted, and who appears, | of all who have written on the subject, to have appreciated his character with most candour and impartiality. "Mr. Tooke was possessed of considerable learning, as indeed his writings sufficiently show. To other more casual acquirements he united a very extensive acquaintance with the Gothic dialects, of which he has so copiously and so judiciously availed himself in his etymological researches; and it seems probable that the leading ideas of his philosophical work first presented themselves to his mind whilst he was pursuing this comparatively unfrequented track of literature. He was extremely well versed in the law, a science, which both in theory and practice was particularly congenial to his mind, and which he had once studied with professional accuracy in the hope of being called to the bar. 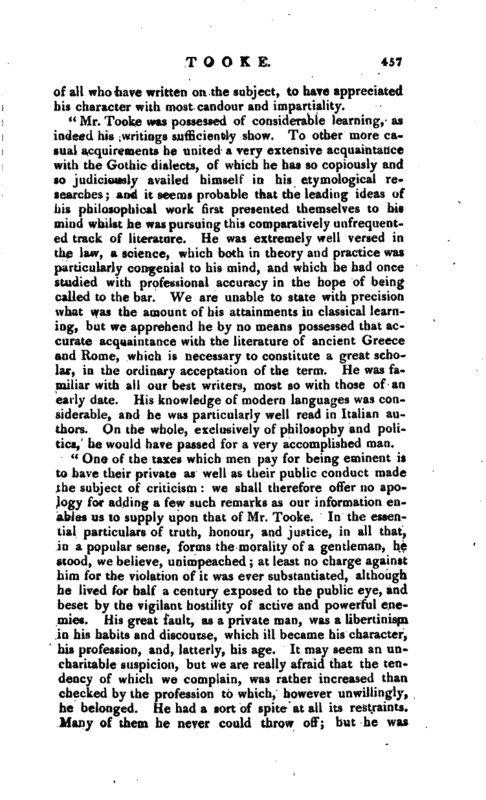 We are unable to state with precision what was the amount of his attainments in classical learning, but we apprehend he by no means possessed that accurate acquaintance with the literature of ancient Greece and Rome, which is necessary to constitute a great scholar, in the ordinary acceptation of the term. He was familiar with all our best writers, most so with those of an early date. His knowledge of modern languages was considerable, and he was particularly well read in Italian authors. On the whole, exclusively of philosophy and politics, he would have passed for a very accomplished man. "One of the taxes which men pay for being eminent is to have their private as well as their public conduct made the subject of criticism: we shall therefore offer no apology for adding a few such remarks as our information enables us to supply upon that of Mr. Tooke. 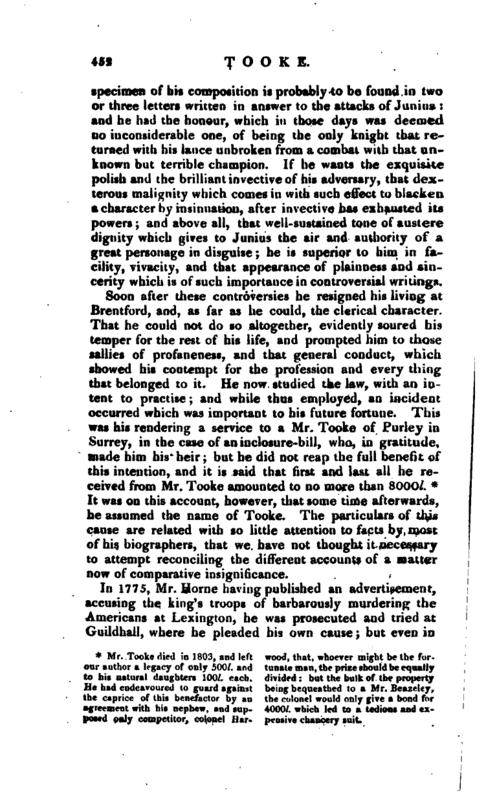 In the essential particulars of truth, honour, and justice, in all that, in a popular sense, forms the morality of a gentleman, he stood, we believe, unimpeached; at least no charge against him for the violation of it was ever substantiated, although he lived for half a century exposed to the public eye, and beset by the vigilant hostility of active and powerful enemies. His great fault, as a private man, was a libertinism, in his habits and discourse, which ill became his character, his profession, and, latterly, his age. It may seem an uncharitable suspicion, but we are really afraid that the tendency of which we complain, was rather increased than checked by the profession to which, however unwillingly, he belonged. He had a sort of spite at all its restraints. Many of them he never could throw off; but he was | anxious to show that in licentiousness at least he could be a layman. 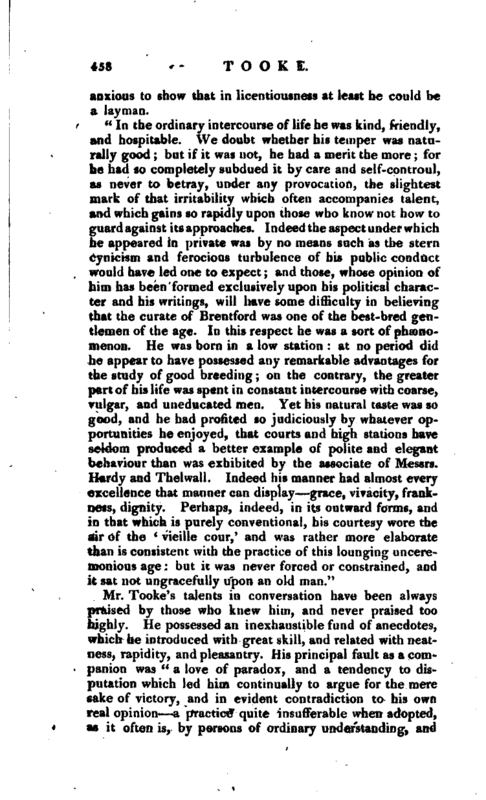 good, and he had profited so judiciously by whatever opportunities he enjoyed, that courts and high stations have seldom produced a better example of polite and elegant behaviour than was exhibited by the associate of Messrs. Hardy and Thelwall. Indeed his manner had almost every excellence that manner can display grace, vivacity, frankness, dignity. Perhaps, indeed, in its outward forms, and in that which is purely conventional, his courtesy wore the air of the ‘ vieille cour,’ and was rather more elaborate than is consistent with the practice of this lounging unceremonious age: but it was never forced or constrained, and it sat not ungracefully upon an old man." 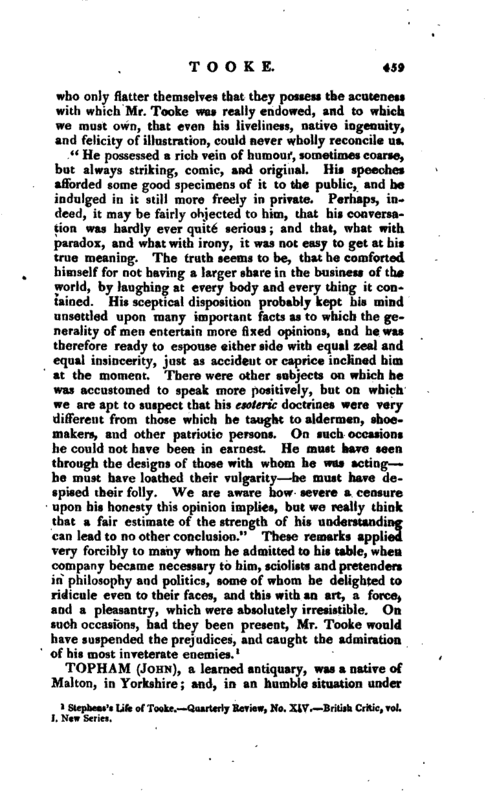 Stephens’s Life of Tooke.—Quarterly Review, No. XIV,—British Critic, vol. I. New Series.